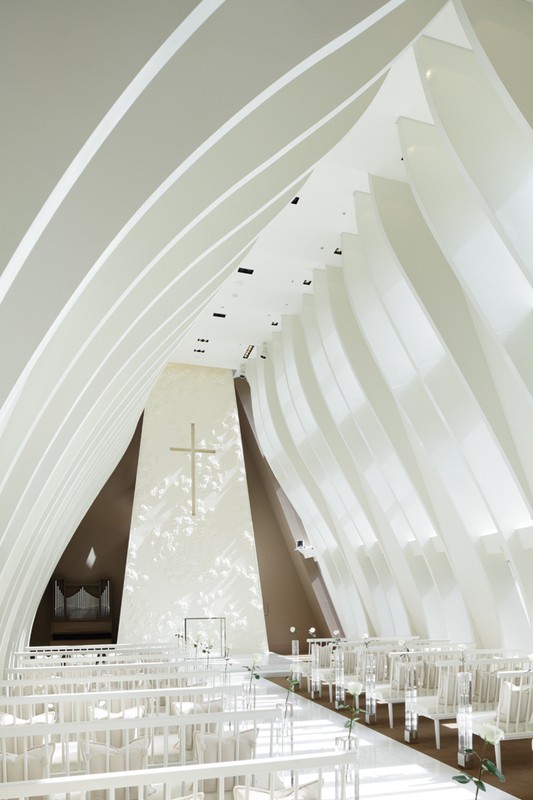 Taipei-based interior design practice Celia Chu Design & Associates has completed a wedding chapel in Fukuoka, on Japanese island of Kyushu. While Japanese wedding chapels traditionally offer views of mountains, landscapes or cities, integrating their natural environment or urban scenery, White Rose Chapel’s location between a shopping mall and a hotel meant it did not have such an aesthetically pleasing setting. 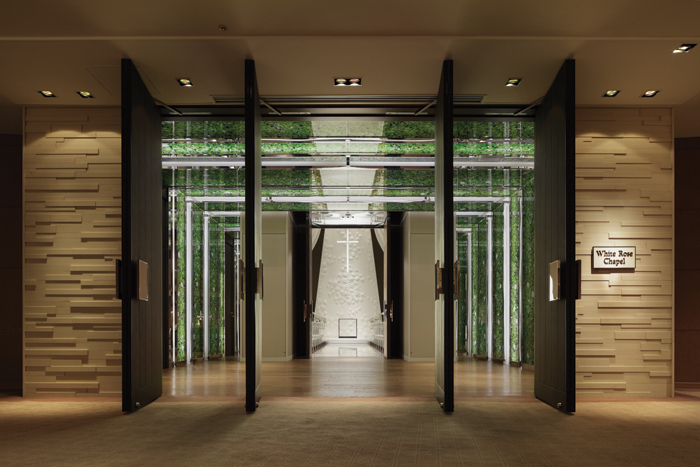 The designers’ challenge was to make the unremarkable chapel building, situated between the Canal City Hakata entertainment and shopping complex and the five-star Grand Hyatt Fukuoka hotel, stand out and be a desirable venue for those looking to tie the knot. Inspired by the idea of a rose bud as a celebration of love – like a budding flower, a relationship will move through various stages from acquaintance to marriage – Chu included rose motifs throughout the chapel. ‘You let them grow and slowly they open; they grow from the seed to the bud and finally they bloom to become a beautiful garden full of roses,’ Chu says. This process also guided the layout of the venue, starting from a narrower entrance, with the perspective widening along the way in the ceremony hall, until reaching the altar and the feature wall with a multitude of white roses. White became the main colour of the chapel, along with earthy tones, such as green and various shades of brown. Entry to the chapel is through large wooden doors leading to an outer hall with backlit glass archways, laminated with a film of images of white roses on a background of green leaves. The ceremony hall, accessible through another set of large doors, features rows of white-lacquer arched panels, which create a bud shape when viewed from a distance. The windows between the panels allow for soft natural daylight to enter the space throughout the day. A marble path leads to the altar and the glass-reinforced gypsum feature wall with blooming white roses, created by renowned Taiwanese sculptor Hsiu-Chi Wang. Seating up to 120 people on white, faux leather cushioned benches, the ceremony hall is also lit with spotlights from high above, with lighting design from Tracy Peng. In addition to the chapel, Chu also designed the function room, inspired by The Little Prince by Antoine de Saint-Exupéry and the eponymous character’s infatuation with a red rose. Framed infinity rose mirrors in the corridor offer a peek of what to expect inside, while cast glass red rose petals and rich red velvet drapery provide visual impact inside the room.